Smoking - The primary risk factor for COPD is chronic tobacco smoking. In the United States, 80 to 90% of cases of COPD are due to smoking. Occupational exposure - Intense and prolonged exposure to workplace dusts found in coal mining, gold mining, and the cotton textile industry and chemicals such as cadmium, isocyanates, and fumes from welding have been implicated in the development of airflow obstruction, even in nonsmokers. Workers who smoke and are exposed to these particles and gases are even more likely to develop COPD. Intense silica dust exposure causes silicosis, a restrictive lung disease distinct from COPD; however, less intense silica dust exposures have been linked to a COPD-like condition. The effect of occupational pollutants on the lungs appears to be substantially less important than the effect of cigarette smoking. Air pollution - Studies in many countries have found that people who live in large cities have a higher rate of COPD compared to people who live in rural areas. [ Urban air pollution may be a contributing factor for COPD as it is thought to slow the normal growth of the lungs although the long-term research needed to confirm the link has not been done. In many developing countries indoor air pollution from cooking fire smoke (often using biomass fuels such as wood and animal dung) is a common cause of COPD, especially in women. 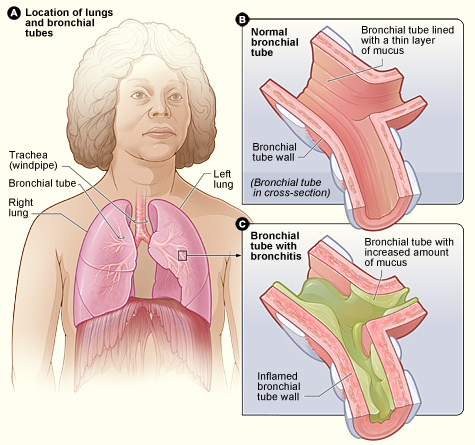 Autoimmune disease - There is mounting evidence that there may be an autoimmune component to COPD. Many individuals with COPD who have stopped smoking have active inflammation in the lungs.The disease may continue to get worse for many years after stopping smoking due to this ongoing inflammation. This sustained inflammation is thought to be mediated by autoantibodies and autoreactive T cells. Oxidative stress produced by the high concentrations of free radicals in tobacco smoke. Cytokine release due to inflammation as the body responds to irritant particles such as tobacco smoke in the airway. Tobacco smoke and free radicals impair the activity of antiprotease enzymes such as alpha 1-antitrypsin, allowing protease enzymes to damage the lung. Asthma is a chronic lung disease which is a very common respiratory condition. It is also known as a reactive airway disease which is inconvenient most of the time but manageable. Asthma is caused by inflammation and constriction of bronchial walls which leads to a series of spasmodic attacks of wheezing and shortness of breath as a result of the hyper-reactivity of smooth muscle in the bronchial walls and in the absence of any other apparent cause. There are various factors such as exposure to cigarette smoke, climate change, physical exertion or emotional stress that causes asthma. It begins during childhood and the disease is commonly triggered by viral infection. Asthma can be diagnosed by the presence of the signs and symptoms. The diagnosis is normally confirmed by presenting a response to a inhaled bronchodialator. Often pulmonary function tests, chest x-rays and blood tests can also be done in order to confirm the diagnosis. 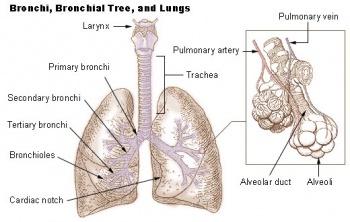 Lung damage and inflammation in the large airways results in chronic bronchitis. Chronic bronchitis is defined in clinical terms as a cough with sputum production on most days for 3 months of a year, for 2 consecutive years. In the airways of the lung, the hallmark of chronic bronchitis is an increased number (hyperplasia) and increased size (hypertrophy) of the goblet cells and mucous glands of the airway. As a result, there is more mucus than usual in the airways, contributing to the narrowing of the airways and causing a cough with sputum. Microscopically there is infiltration of the airway walls with inflammatory cells. Inflammation is followed by scarring and remodeling that thickens the walls and also results in narrowing of the airways. As chronic bronchitis progresses, there is squamous metaplasia (an abnormal change in the tissue lining the inside of the airway) and fibrosis (further thickening and scarring of the airway wall). The consequence of these changes is a limitation of airflow. Patients with advanced COPD that have primarily chronic bronchitis rather than emphysema were commonly referred to as "blue bloaters" because of the bluish color of the skin and lips (cyanosis) seen in them. The hypoxia and fluid retention leads to them being called "Blue Bloaters." A lateral chest x-ray of a person with emphysema. Note the barrow chest and flap diaphragm. Lung damage and inflammation of the alveoli results in emphysema. Emphysema is defined as enlargement of the air spaces distal to the terminal bronchioles, with destruction of their walls. The destruction of air space walls reduces the surface area available for the exchange of oxygen and carbon dioxide during breathing. It also reduces the elasticity of the lung itself, which results in a loss of support for the airways that are embedded in the lung. These airways are more likely to collapse causing further limitation to airflow. The effort made by patients suffering from emphysema during exhalation, causes a pink color in their faces, hence the term commonly used to refer to them, "pink puffers". Unfortunately there is no single diagnostic test for COPD; diagnosis relies on the presence/absence of symptoms and clinical judgement. The best approach is to undertake a detailed subjective history and physical examination. As COPD is not curable the earlier that it is diagnosed, the earlier treatment can start and that may help to slow down the progression of the disease and the subsequent damage to the lungs. Assessment - A diagnosis of COPD should be considered in patients over the age of 35 who have a risk factor (generally smoking) and who present with exertional breathlessness, chronic cough, regular sputum production, frequent winter ‘bronchitis’ or wheeze. X-Ray - An x-ray of the chest may show an over-expanded lung (hyperinflation) and can be useful to help exclude other lung diseases. Pulmonary function tests - Complete pulmonary function tests with measurements of lung volumes and gas transfer may also show hyperinflation and can discriminate between COPD with emphysema and COPD without emphysema. Blood tests - A blood sample taken from an artery can be tested for blood gas levels which may show low oxygen levels (hypoxemia) and/or high carbon dioxide levels (respiratory acidosis). A blood sample taken from a vein may show a high blood count (reactive polycythemia), a reaction to long-term hypoxemia. Follow the link here for a list of outcome measures within Physio-pedia. There can be a different number of ways of measuring the impact or change of someone's COPD, examples being from lung function, lung volumes and exercise capacity. It is known that COPD lungs lose function quicker and more rapidly than non-COPD lungs. In recognition of this FEV1 is the most important marker to determine severity and treatment in COPD algorithms, with decline of FEV1 over-time as the marker for disease progression. The ratio of FEV1/FVC (Forced vital capacity) as well as the percentage predicted FEV1 is a fixed ratio used in current guidelines to assess the function of lungs. Patients with similar FEV1 may represent different underlying phenotypes. In terms of measurement static lung hyperinflation and its increase during exercise (dynamic hyperinflation) are measured as elevations of total lung capacity (TLC), functional residual capacity (FRC), residual volume (RV) and as a decrease in inspiratory capacity (IC). Includes the 6 Minute Walk test, the Bleep Test, Shuttle Walk Test and Ergometry. As COPD is not curable the aim of treatment and interventions are directed at improving quality of life by managing symptoms and exacerbations and slowing down damage to the lungs. Encouraging patients with COPD to stop smoking is one of the most important components of their management. All COPD patients still smoking, regardless of age, should be encouraged to stop, and offered help to do so, at every opportunity. Exercise prescription is a key component of pulmonary rehabilitation programmes, which are part of the non-pharmacological approach to managing COPD. There is a high level of evidence for the benefits of pulmonary rehabilitation for people with COPD Strength and endurance exercise are endorsed for people with COPD. 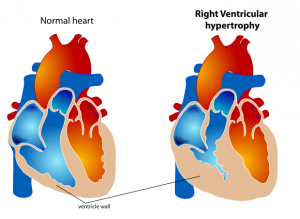 Muscles that are required for arm exercise are also involved in movement of the chest wall during respiration and thus the need to breathe often compromises the individual’s ability to undertake daily activities, therefore exercise prescription involving arm exercise needs to be carefully prescribed. Offer LAMA in addition to LABA + ICS to people with COPD who remain breathless or have exacerbations despite taking LABA + ICS, irrespective of their FEV1. Pulmonary rehabilitation should be made available to all appropriate people with COPD including those who have had a recent hospitalisation for an acute exacerbation. Non-invasive ventilation (NIV) should be used as the treatment of choice for persistent hypercapnicventilatory failure during exacerbations not responding to medical therapy. It should be delivered by staff trained in its application, experienced in its use and aware of its limitations. When patients are started on NIV, there should be a clear plan covering what to do in the event of deterioration and ceilings of therapy should be agreed. The frequency of exacerbations should be reduced by appropriate use of inhaled corticosteroids and bronchodilators, and vaccinations. COPD care should be delivered by a multidisciplinary team. ↑ Kennedy SM, Chambers R, Du W, Dimich-Ward H (December 2007). "Environmental and occupational exposures: do they affect chronic obstructive pulmonary disease differently in women and men?". Proceedings of the American Thoracic Society 4 (8): 692–4. ↑ 9.0 9.1 Rutgers, Steven R.; Postma, Dirkje S.; Ten Hacken, Nick H. .T. ; Kauffman, Henk F.;van der Mark,Thomas W; Koeter, Gerard H.; Timens, Wim (2000). "Ongoing airway inflammation in patients with COPD who do not currently smoke". Thorax 55 (1): 12–18. ↑ Roisin RR, Rabe KF, Anzueto A, et al. Global strategy for the diagnosis management, and prevention of chronic obstructive pulmonary disease. Bethesda, MD: Global Initiative for Chronic Obstructive Lung Disease, 2008; 1–91. ↑ Ennis S, Alison J, McKeough Z. The effects of arm endurance and strength training on arm exercise capacity in people with chronic obstructive pulmonary disease. Phys Ther Rev 2009;14(4):226–39.